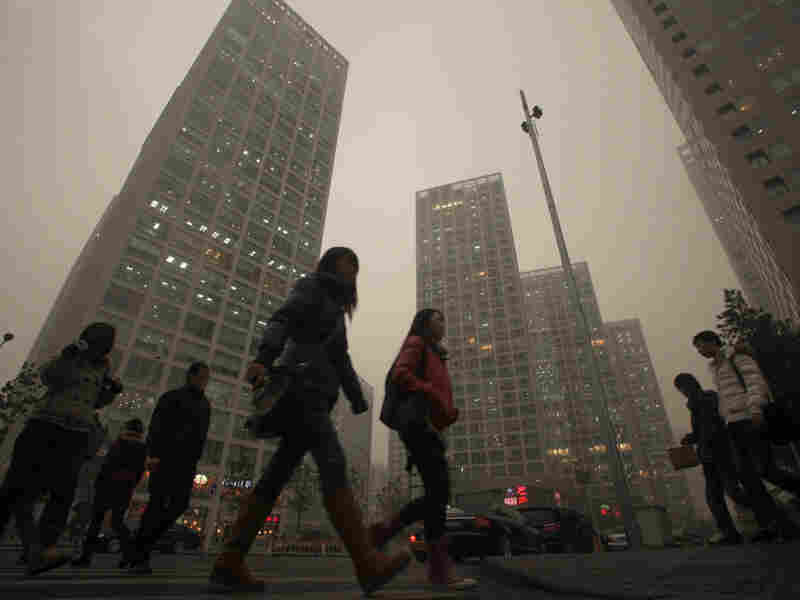 Clean Air A 'Luxury' In Beijing's Pollution Zone For more than half of the past 60 days, the air pollution in the Chinese capital has hit levels hazardous to human health. Experts estimate long-term exposure to such pollution could reduce life expectancy by as much as five years. NPR's Louisa Lim describes what it's like living in the city. 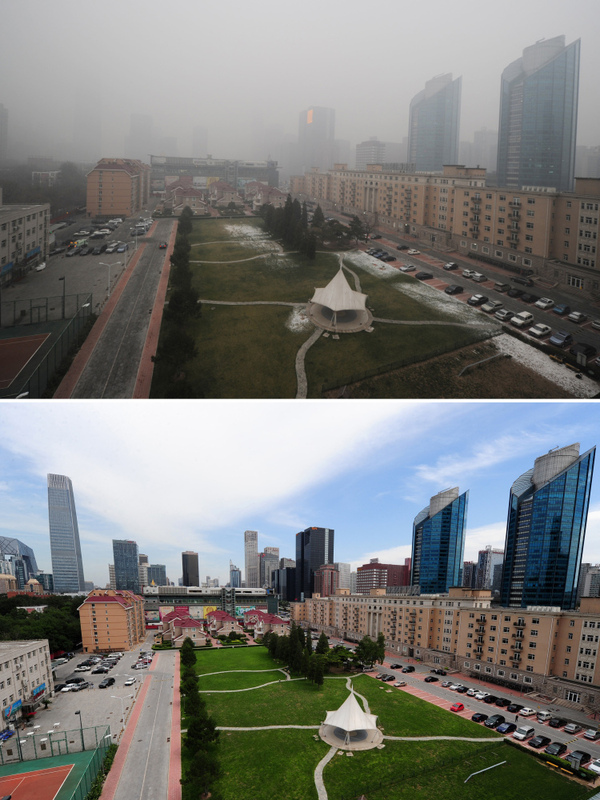 These photos show pollution in Beijing on Dec. 5 (top), compared to a blue sky day (bottom) on Aug. 18. In recent weeks, heavy pollution — caused by coal-fired power plants and vehicle emissions — has led to hundreds of flight cancellations and road closures. Long-term exposure is leading to serious health costs. On the way to school, my kids and I play a guessing game: How polluted is the air today? We use an app linked to the air pollution monitor at the U.S. Embassy in Beijing, and we try to guess the day's exact level on the Air Quality Index, and whether the air is dangerous. These days, chances are that it could well be. For more than half of the past 60 days, the air pollution has hit levels hazardous to human health. Experts estimate long-term exposure to such pollution could reduce life expectancy by as much as five years. But I don't tell the kids that. Living inside the pollution zone, those daily measurements determine how my family spends its days. Whenever the levels hit "very unhealthy," we keep the kids indoors and refuse to let them take part in outdoor activities, no matter how much whining might ensue. 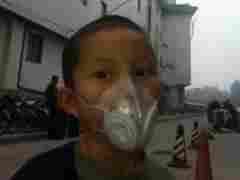 When to wear a pollution mask, when to stay indoors, it's all become crucial knowledge, even for our 4-year-old. That U.S. air pollution monitor has become central in the debate over Beijing's air quality, since it measures fine particles and thus produces different readings to China's official statistics, which measure only larger particles. According to leaked cables, in 2009, Chinese officials claimed the air monitor's readings were causing "confusion" and undesirable "social consequences" among the Chinese public, and asked the embassy to consider limiting access to the data to American citizens. This hasn't happened, but the existence of these divergent readings has placed pressure on the government to reform its air pollution reporting, a move that it has vowed to make in 2016. One prime example was last Sunday, when the pollution was literally off the U.S. Embassy air monitor scale, hitting a level described as "beyond index." In contrast, according to the Beijing Municipal Bureau of Environmental Protection, the air pollution was "light." China's equivalent of Twitter is awash with sarcastic comments about air quality. "Suggest the Beijing government gives everybody a face mask ... in order to stimulate domestic consumption," tweets one user. "Today in China clean air, clean water, safe foods, kind hearts and the truth have all become luxury items," tweets another. Given the amount of time my kids now spend indoors, I decided to get an expert to check the air inside my apartment. This, it turned out, was a decision that has entirely ruined my peace of mind. "We do that quite a lot," admitted Chris Buckley ruefully, after measuring the indoor pollution in our apartment. The British expat runs a business selling imported air purifiers. I had been expecting the worst, but the readings were more alarming than I had imagined in my worst moments. Inside the living room, where the kids construct dens out of sofa cushions, the level of air pollution — or, more specifically, fine particulate matter — was an estimated 208 micrograms of PM2.5 per cubic meter. That's five times higher than the level considered safe by the U.S. Environmental Protection Agency. In fact, in the U.S., the level of pollution inside my living room would be "very unhealthy," verging on "hazardous." "I guess I'm the only guy who wakes up when the air pollution is terrible and looks at the sky and thinks, 'Hmm, OK, this is not bad,'" said Buckley, who says his business is booming. "It's been good, the last year, especially the last 12 months when the air has been foul. We're doing fine." Former Chinese Premier Zhu Rongji even weighed in on the health hazards. "If I work in your Beijing, I would shorten my life at least five years," Zhu reportedly told city officials in 1999. And researchers say that estimate is actually not so far off the mark. Chinese walk to work midday as heavy smog hangs over downtown Beijing. Avraham Ebenstein of the Hebrew University of Jerusalem describes those seemingly throwaway words as "astoundingly close to the estimates that we observe." Ebenstein has been crunching decades of Chinese statistics to come up with one of the few studies on the long-term effects of living with high levels of pollution. "We estimate about five to six years of foregone life expectancy over the long haul for living in Beijing relative to [China's] southern cities," he says. Together with colleagues from Columbia University, the Brookings Institution, Peking University and Tsinghua University, Ebenstein looked at life expectancy rates north and south of China's Huai river. That's relevant because the government provides heating — mainly coal-powered — north of the river, but not south. As a result, air pollution is much worse north of the river. The researchers used air quality readings from 91 Chinese cities from 1981 to 2000, as well as health data from China's disease surveillance system from 1991 to 2000. For cities north of the Huai river, where the pollution is worse, they found lower birth rates, as well as higher adult mortality rates for respiratory-related diseases like heart disease and lung cancer. When asked how relevant his findings are now, given that much of the data is historical, he says, "The answer is we don't know. On the one hand, the air pollution isn't as bad now as it was before, and those people lost five years." "But since you're going to have less of a chance of getting other kinds of illnesses" given improving standards of living in China, Ebenstein says, "if you're exposed to air pollution now, as a relative share of the health cost to you, it could still be a really big factor. It could have a really large impact of life expectancy." Even the state-run China Daily admitted this week that the smog was a "severe hazard," quoting a health official as saying that the lung cancer rate has increased in Beijing by 60 percent during the past decade, even though the smoking rate has not increased. For those of us living here, protecting our kids from the air they breathe is almost impossible. For a long while, our major strategy was denial, but this is no longer an option. It's clear that there is a health cost in living in such pollution. And the immediate cost to us of doing this story has been almost $3,000 in new air purifiers — an option that's out of reach for most Beijing residents.